So... usually I'm only in Jeju about once every other year... and last year I had already gone for a trip back in May. 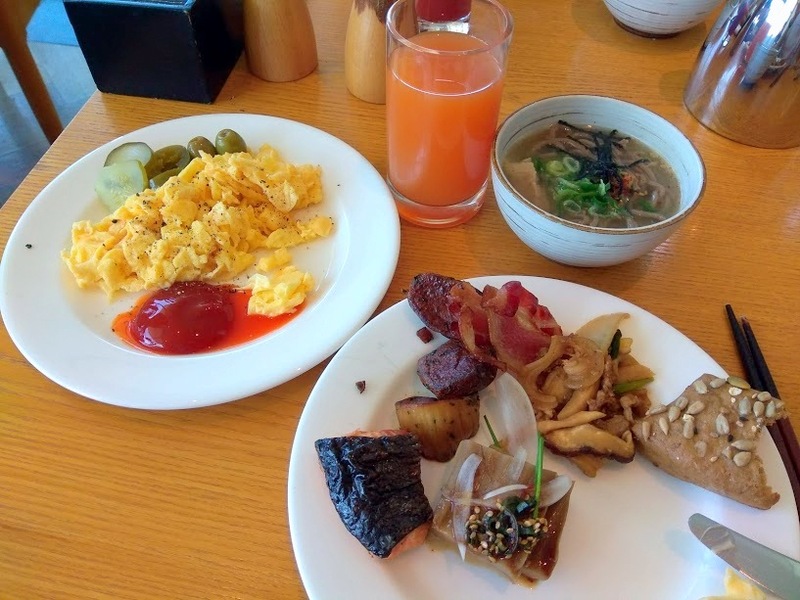 Then another opportunity came via a close friend who happens to have work connections with the Hyatt Regency Jeju near Seogwipo and so a group of us decided, why the heck not, and went on a last minute, three-day weekend trip. Which all goes to say, more Jeju-related info for all y'all Jeju info hungry folks. Arrived on our first day and went to the car center to get rentaled up. Then first thing was to get fueled up. As it was still early morning, we opted for something lighter by checking out a spot called Dodu Hyenyeoeo Jib. Situated just a few kms west of Jeju City, and on Dodu Harbor we arrived just early enough to be promptly seated. Offering the standard Jeju seafood fare, dishes include hwoedeopbap, jeonbokjuk (both 10K each) urchin seaweed soup (7K), and mool hwoe (10K for regular and 15K for a bowl that includes abalone, urchin, and squid. Some of their dishes like the urchin bibimbap (15K), squid seaweed soup (10K), marinated and grilled mackerel (16K) are seasonal so you'll have to check to see if they're available. Signs show hours are from 10-9 daily with their break time being 3:30~5. Getting additional side dishes is self-serve. On our visit, these were the side dishes. Pickled peppers, squid jeot gal, stir fried anchovies, and kimchi. We opted for the abalone mul hwoe, jeongbokjuk (abalone porridge), and the urchin seaweed soup. Jeonbokjuk (abalone porridge) will never really win a beauty contest and this one was no exception but this was one of the best bowls I've sampled on the island. In the flavor department the delicate taste of the abalone were enhanced by the sesame oil that was thoroughly incorporated into it giving it such a pleasant and borderline creamy(?) aspect to it. It was also expertly simmered so that the porridge is so smooth yet with just enough density to the rice that it's not just mush. Digging in you'll find ample bits of abalone meat for some added texture and taste. One friend, who admitted he wasn't normally a fan of abalone porridge, said this was excellent.... so there you have it. The mulhwoe was also just a burst of seafood and veggie freshness in the mouth. Just tangy, sweet, and savory enough to be the equivalent of a flavor sparkler (in the mouth! ), the abalone came gleaming while the crunchy cucumbers and kelp gave it added texture. Just a well-rounded, well done mulhwoe. The biggest surprise for me came from the urchin and seaweed soup. I'm a fan of miyeokguk (seaweed soup) in general but prefer it with beef and I had reservations that the urchin would give it an overly fishy taste to it. Instead it heightened the flavor of the broth and enhanced it to make it such a comforting bowl of goodness. There was a kind of ochasuke kind of taste to it which I can't quite put a finger to which made me picture it as a perfect bowl to have with rice on a chilly day. We had come to this spot thinking it was more of a random find but we found out we had come in just before the lunch crowd as there was a wait outside by the time we had finished! Just goes to show its popularity. Overall, an unexpected gem! We stopped for a quick refueling at Bomnal Cafe. I've written about this place in my previous post and its views were just as beautiful as ever. This time we nabbed a spot outside to enjoy the ocean views while the coffee was also brewed strong. We also stopped by one of my favorite beaches, Hyeopjae Beach, but I've written about that place so many times now that y'all can take a look from previous posts for more info and pictures on it. We were pretty tired from our early morning flight and since the famous Anthracite Cafe, ala Seoul, has its own branch in Jeju, just near Hyeopjae Beach, we decided to check it out for some extra caffeination. True to its low key roots, their Jeju branch is also one of rather obscurity- no sign or indication exists to reveal itself and if you didn't know, you'd just as easily pass by this building. The cafe is located within an old farm barnyard which the cafe has maintained its rustic atmosphere. Much of the equipment still remains the structure's high, vaulted ceiling kept intact with shafts of light streaming in from the ceiling and windows. The space also keeps the natural Jeju volcanic rock floor and plants intact with tables scattered about the floor space. With some minor tweaking, this would be one of those spaces that would be extremely popular for an intimate wedding back home. There's also a small bookshelf with some Korean books to browse for patrons. The barista bar is located somewhat in the center of the floor plan with everything- from ordering to coffee making- in the open. Menu is as below with most drinks in the 6-7K range. Just a tad bit on the pricier side but comparable to the Anthracite branches in Seoul. Anthracite's beans are already well known so their coffee drinks are quite nicely done. I had a sip of my friend's ginger ade which was nice and refreshing. Just make sure you mix it all up as the different ingredients settles and layers. This dense fruit cake kind of dessert was ok. A bit lacking in the sugar department to call it a dessert but not really a loaf either with its dense, cake-like consistency. Their high grade milk ice cream was milky and delicious though. Despite its atmosphere, the downside of the cafe's space is that it is so dang hot. Even with 3 or 4 AC machines scattered about, the size of the cafe plus the numerous windows meant it was rather unpleasantly warm inside... and I was there in late summer! And that same disadvantage, I'm quite sure, means that in winter time it'll probably be quite cold. So I suppose overall it's worth checking out for the drinks, atmosphere, some picture-taking but don't plan to stay very long unless you happen to come on a perfect day, climate-wise. Do be sure to explore the outdoor grounds as well. In my previous post, I wrote about one of the best fried chicken I've ever had which was in Jeju's Olle Market in Seogwipo. It was actually something I looked forward to having again. Unfortunately, by the time we returned to the hotel on our first night and called them, they had sold out for the day. We ended up ordering from this place called Jeju Seureop Dak (제주스럽닭) which many reviewers also claimed to be one of the must-have fried chicken on the island. The claim to fame for this chicken is that the fried chicken not only comes with fried abalone but in a housemade Jeju tangerine sauce. Definitely being a chicken variety you can't find on the mainland, it really piqued our curiosity. Seeing how the closest branch was just a few minutes away from our hotel, we paid a visit and found we had a nearly 40 minute wait (that's how popular it was) but luckily we had placed an order via phone beforehand so our wait was only about 20 minutes. The shop itself is more a kitchen than a restaurant and I recall there only being 1 or 2 table and the rest of the space basically a chicken frying shop. All this is to say that it's probably best you take the chicken here to go. 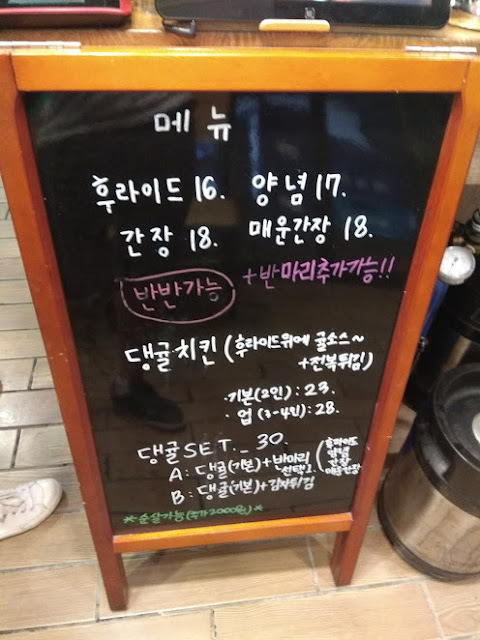 Regular fried is 16K, yangnyeom 17, soy sauce 18, spicy 18. Half/half orders and additional half orders also possible. The regular tangerine chicken is 23K for 2 people and 28K for the larger portion for 3-4 people. You can also opt for a set in which you can get the regular sized tangerine chicken and a half chicken of your choice of other flavor (or fries) for 30K. We picked up our freshly fried chicken and brought it back to the hotel to eat. Upon opening this was the sight that greeted us. Visually quite a looker with its juicy-looking chicken and abalone pieces, tangerine glaze and bits of fried and fresh tangerine atop. Unfortunately the visuals didn't carry over to the dish's execution. The tangerine sauce in itself was syrupy sweet. Even Panda Express' orange chicken back in the States would have been a less cloying affair to this chicken. On top of that the syrup really dampens the chicken's crispness and it just resulted in a much-to-be-desired state (though, to be fair, we did take the chicken to our hotel). We actually had leftovers after the first night which we stored in the fridge and tried to finish the next day. Though it did seem to improve somewhat as a cold, rather than hot chicken, we still couldn't finish it. And at 28K for the tangerine fried chicken, it's not exactly cheap either! We washed the syrupy sweet chicken down with some Jeju-only makgeolli we picked up at the local market for a friend who hadn't been to Jeju before. The hallabong makgeolli is also as sweet as ever and the peanut one still not very much peanut-y to my taste. I suppose of the Jeju variety, this makgeolli made with millet is most agreeable to my palate but it seems makgeolli in itself is not something Jeju is in its most comfortable element (though its other traditional drinks are not bad). Our place of accommodation was the Jeju Hyatt Regency which we were able to stay at a wonderful rate thanks to a friend's work connections. The hotel property is older, especially compared to all the many recent resorts that have opened all around the island in recent years. I even remember visiting this property back in 2002 when I first visited Jeju Island and even then it wasn't considered a new property. Though the hotel does show its age in and out, it's still a perfectly comfortable place to stay with a good location and enough amenities around to keep all ages entertained. It has a beach right below the hotel, a decent sized swimming pool, restaurants, and entertainment options such as the K-Pop Museum and Teddy Bear Museum nearby (thus its particular popular with families with kids). The package we made through our friend also included both breakfast and dinner everyday which, initially, I was a bit sad about as that meant less meals to enjoy on the island but it definitely had its perks of saving time and money and just enjoying time to sleep in and chill in the hotel. Thankfully the food was pretty good too. A nice variety of eastern and western favorites for both the breakfast and dinner buffets that also changed up a bit on a daily basis. 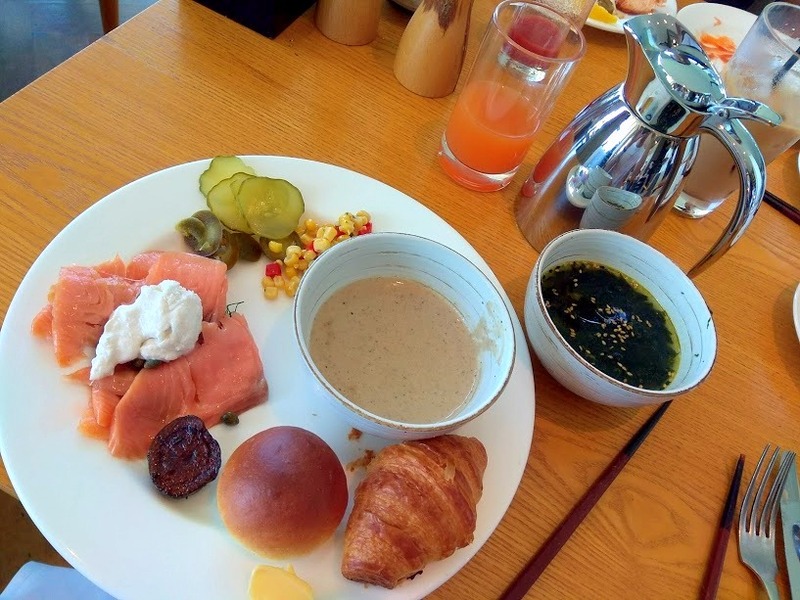 I was a bigger fan of the breakfast buffet which included pre-made and made-to-order options. They were doing barbecues at night which were hits or misses depending on the cuts. Overall, though its not quite to the level of the Terrace at the Grand Hyatt Seoul, overall very solid. In all my visits to Jeju I can't believe I've never been to Hwangwooji Coast. I've been to the same area a few times to Oedolgae and such but strangely enough I never went down to this popular swimming hole. From the parking lot, it's about a 5 minute walk down along the rocky, volcanic coast which sure is pretty. Here, there are a few enclosed pools that make it popular with swimmer and snorkelers. It's shielded by the various rock formations which makes it safer for kids. This also means that it's popular with families so by the time it got to the afternoon it filled up pretty fast. You can rent snorkeling equipment, tubes, life vest and other beach gear from the vendors here though it's not exactly the cheapest. If you plan to come here, prepare accordingly with your own gear if you want to save some money. After a morning of swimming and chilling, we headed into Seogwipo to grab lunch and decided on a restaurant called Sambo Sikdang. An old school bap jip, this place has been around for decades now which is evident by its humble exterior and interior. Originally a place where the locals came to eat, in recent years its become popular with visitors in town. The menu reflects the standard Jeju bap jip fares including mool hwoe, fish, seafood stew etc. Most of the mains range between 16K for the grilled mackerel to 55K for the grilled abalone. There are a few baekban (meal sets) available including abalone stew (15K), sea urchin seaweed soup (16K), damselfish mool hwoe (13K), kimchi jjigae (7K), galchi stew (18K), squid mool hwoe (13K), and more. These come with rice and other offerings while the rest of the dishes you'll have to order rice separately (1K a bowl). The mains are bigger though and meant to share so we opted for a grilled mackerel and a braised galchi. The sides were clearly homemade and delicious. You can always tell if a Korean restaurant is going to be good by their banchan and Sambo Sikdang clearly knew what they were doing. That pa kimchi (scallion kimchi) was particularly good and I'm generally not a fan of pa kimchi! Dwenjang soup. A Korean meal isn't complete without soup and the dwenjang soup differs a bit from the mainland as they add radish (famous in Jeju) which adds a deeper element to the broth. And our mains! It takes a few minutes for the main dishes to come out as they are made to order and everything came hot from the kitchen and looking (and smelling) deliciously. The braised galchi (hairtail), or galchi jorim, was superb in every way. People mistake jorim dishes as ingredients haphazardly thrown together in a pot with seasoning and cooked (and which some restaurants actually do unfortunately) but for a proper jorim, care needs to be taken in the order that the ingredients are put in as well as their respective cooking time. As you can see from the picture alone the radish has been cooked thoroughly so it has soaked up the flavors of the sauce but still retains their shape, the vegetables are still crisp with bite, and the fish (though you can't see) was flaky and packed with flavor as well. The grilled mackerel was excellent as well. Hot from its cooking, there was a nice golden and crispy crust which encased the juicy flesh inside. Seasoned simply with salt and to the point it's just savory to perfectly balanced when eaten with the steaming white rice. Really good food. Prices comparable to other restaurant on the island. Sambo knows what its doing. We were driving along the coast when we stumbled upon this small cafe. Honestly the food and drinks are average with clearly a part time worker taking orders and punching machines to shell out drinks and snacks. But what a view it has. This is Seop Seom, or Seop Island just off the coast and what a peaceful view it is. If you don't want to shell out money for the mediocre drinks, there's an area below the cafe you can just rest and gaze out into the open sea. For a little excursion, we decided to check out Socheonji which I had read as a photogenic spot. Located by the Jeju University training institute grounds and park, it's a short 8-10 minute walk to the spot. The path takes you through a little forest on the hills. Socheonji, which means little pond of heaven, is called that because the waters, on clear days, is said to reflect the sky in a similar manner to the crater on Mt. Baekdu. ...unfortunately it wasn't that clear of a day when we went and it was mostly pools of water surrounded by volcanic rocks. Though parts of the pools were clear, it certainly wasn't as clear as in the many pictures I saw online. The signs also says that on certain days you can see Mt. Halla reflected off the pools but definitely wasn't the day on our visit. And you have to gaze with the sea basically behind you to even look in the direction of Mt. Halla. Ehh... not a must but maybe if you're a photographer and the day is really nice! I mentioned the Jeju Hyatt Regency is just above a beach. Jungmun Saekdal Beach is a wide spanning beach with colorful sand. Its waves makes it a popular spot for surfers and other water sports enthusiasts. As the beach is surrounded by a cluster of hotels, it's quite popular year-round though it's pretty wide so it didn't feel crowded. Just another perk of staying at the hotel! It's not a proper visit to Jeju Island without some Jeju pork. We decided to take a chance on a restaurant called Kkeomeong Mokjang, or Black Ranch, after the many positive reviews. 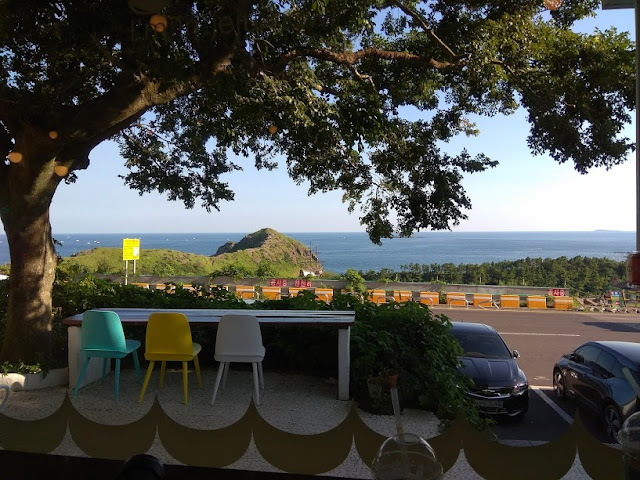 The restaurant itself is located somewhat away on a hill by the coast and is not easy to get to without a car (though the views are quite nice). Upon entering, I was first shocked at how spacious the restaurant was and also by its very modern, high-ceiling interior. The style and setting of Black Ranch was not too different from a restaurant you'd find in Gangnam or Itaewon in Seoul. The restaurant's center features the self bar which includes most of the sides, ssam, and various sauces and dips you can refill to your heart's content after the initial serving. Jeju pork is the focus here and you can get either pork belly (ogyeopsal) or pork shoulder (moksal) in either the black pig variety or the white. The black pork cuts are 19K for 200g while the white are 14K for 200g with all the pork certified as Seogwipo-based livestock. They also feature a range of add-on dishes such as cold yeolmu noodles, kimchi jjigae, steamed eggs, Jeju shrimp dwenjang jjigae which all run 6K for each. Grilled okdom fish and galbitang are both 10K each while rice bowls are 1K. Soju and beer run 4K a bottle with baeksaeju, cheongha, bokbunja and soft drinks also available. All in all, quite reasonable in price. Sides were Korean barbecue restaurant standards with kimchi, pickled vegetables, pa muchim, salad, radish muchim. Produce and vegetables were fresh and well-maintained. Hot charcoals were brought out, followed by the grill, the pork, and of course the jeotgal for dipping ala Jeju-style. We tried both the black pork belly and shoulder. Both were thick, Jeju-style cuts very flavorful and juicy. The pork may have not been as mind-blowing as Donsadon (but nothing has ever come close to Donsadon) and for Black Ranch's still excellent quality and also their prices that are about a third of Donsadon's, the pork here is beyond good. The grilled okdom was okay. It didn't seem it was fried-to-order and it didn't have as much meat on it as I'd had in other places. A skinny ol' thing. The kimchi jjigae was the biggest disappointment. The kimchi wasn't fermented enough to make it into jjigae and lacked the tart punch and deeper flavors of a proper kimchi jjigae. Yeolmu guksu was good but it's hard to mess this dish up. Nothing spectacular about the dwenjang jjigae but it was a nice fine, mellow stew. Basically the high quality pork is what you should mainly focus on here. The flavorful pork and reasonable prices are good enough reasons to visit if you're close by but add to that the friendly service, spacious table seating, and excellent views and this is one of the better Jeju pork I've had on the island. On our final day, we wanted to stick close by and not waste time by venturing too far out. One of the biggest attraction near to the hotel was Camellia Hill which we all had heard about but none of us had visited. It wasn't exactly on the top of our list and we were on the fence for a while but decided to go for it. Tickets need to be purchased for admission which is 8K for adults, 6K for youths, and 5K for young children. There are some Jeju-based mobile applications and other guide books that sometimes offers like 1 or 2K off but most of them are in Korean. While many attractions in Seoul were only recently, and hastily, constructed and opened to take advantage of the growing influx of tourists every year, Camellia Hill actually took 30 years to be what it is today- a sprawling gardens that stretches nearly 120,000 square meters. As its name suggests, some 6,000 camellia trees from 500 different varieties are planted all over the grounds including many that release a natural sweet scent when in bloom. It takes a good hour and half to explore the full grounds with guided maps to lead the way. While there were so much information on camellias and their different varieties, season-wise we weren't there for their blooming so unfortunately we didn't get to see any camellia flowers. I've seen pictures in the spring when they're in bloom though and they do look lovely here. But luckily the gardens itself is picturesque with ponds, forest trails, art installations, and the occasional cute IG-worthy spots set up. A lovely indoor garden is quite a beautiful spot to sit on one of the many tables though I'm sure it's too hot to do so in the summer. And though we didn't happen upon any camellia blooms, there are still some 250 varieties of other plants that called the grounds home so plant lovers should still be able to enjoy this attraction. For lunch we decided on another Jeju favorite, gogi guksu or pork noodles. Geomong Guksu is rather oddly named since it means black noodles but there isn't a hint of blackness in any of the dishes here. It also, coincidentally, is similarly named to Ggeomong Mokjang or Black Ranch, the Jeju pork restaurant we had dined the night before though the two restaurants aren't related. In addition to gogi guksu, they also do hoe guksu (basically bibimguksu with hwoe) and other noodle dishes with their noodles interestingly made with bell peppers (paprika) incorporated into them. Sides are simple with yeolmu kimchi, buchu (chives) muchim, and pickled radish. The gogi guksu is 7K a bowl while the hwoe guksu is 8K. The hwoe guksu comes with the noodles, vegetables, and hwoe separate. They had actually run out of hwoe for the day and asked if we were ok with hanchi, cuttlefish, being substituted instead. Mixed up in the spicy sweet sauce, it's tasty enough. I'm not too crazy about cho gochujang-based sauces and subsequently dishes like bibim guksu in general but I liked the variety of textures that were included with the crunchy soybean sprouts, chewy cuttlefish, smooth noodles. The gogi guksu is very clean in taste and a little less rich than other gogi guksu places but still tasty. The ample chopped scallion gives it a nice herbal note. There weren't that many pieces of pork in it, though, which was a bit of a downer. As mentioned, the restaurant randomly incorporates bell peppers into their noodles which gives it the yellow tinge to it. You can also see flecks of the ground bell pepper in the noodles. I'm not sure there's enough bell pepper in it to change the flavor or makeup of the noodles in a significant way but I'd like to believe there's some added nutrition in there. For our caffeine fix, we headed over to Lazybox Cafe, a favorite cafe of mine which I've written in detail before. One reason I love them is because their beans are from Coffee Libre- a no-frills, excellent Seoul-based roastery that's known for their high quality beans and turns out good brews. It seems Lazybox has expanded their menu a bit too since my last visit. And I love this cafe secondly because of their wonderful views overlooking the ocean. With a good strong brew in hand and the ocean breeze gently blowing in your face. It's really just a moment of bliss. Do be careful though as there were a few wasps around this time! Don't forget to check out the beautiful Sanbangsa Temple just next to the cafe if you haven't been before! For our last meal, we decided to stop by this famed eatery as one of the members of our group is a big tteokbokki fan. Myeongnang Snack, or "Cheerful Snack" as it translates, is well known already and is often considered to be one of the best tteokbokki restaurants on the island. Recently it was featured on a Korean television show only adding to its popularity. It's located rather out-of-placely within a local, humble neighborhood but you'll notice it by the lines that are almost guaranteed to be there. Lines, particularly at peak hours, are a given as they don't accept reservations. So you and your party must wait in line even if you are ordering take out. Parking is also limited and they warn you about parking in the restaurant across from them, even when they're closed. Considering it's a tteokbokki, bunshik-style menu, prices are high. But it is Jeju Island. Tteokbokki runs 4K a serving while their jjajang tteokbokki is 10K for 2 serving. Besides their tteokbokki they only do fried dishes including their battered and fried king shrimp (8K for 2 and 16K for 4), their fried cuttlefish (12K... though it wasn't being offered on my visit), and their fried black pork (7K). Drink choices are cola or sprite (2K) or draft beer (4K). Besides owing to their popularity, one of the reasons there's always a line is because seating is quite limited. Perhaps 15 people max and if you're in a group larger than 4, you'll likely have to split up for seating. Their counter and kitchen share the same space and in the open. While on one hand the open kitchen helps reassure the food is being prepared accordingly, the continuous frying does give the restaurant a slight greasy scent that lingers in the air. Also note that orders are made at the counter and everything pre-paid and self-served. Everything is also cooked to order so it does take a few minutes for the food to come out. We opted for the regular tteokbokki, the fried shrimp, and the fried black pork and this is what came out. For its high prices, they certainly don't cut corners on their fried dishes which come piping hot from the fryer and on a bed of their addictive crispy bits. The tteokbokki in itself is simple and decent. Not overly spicy or sweet, it's a good balance of flavors that most anyone should easily be able to enjoy. It's also very soupy which is purposeful as it's supposed to pair with the crunchy fried dishes. The fried shrimp's battering and style is very similar to a famous place in Hongdae called Miminae which is also known for their unique batter style. Instead of a big glob of batter that encases the shrimp, there are these tiny, crunchy strands that clings and forms mini crunch "strings" for a different spin on this popular dish. I'm even convinced the restaurant owners researched Miminae because this was the first time I've encountered a similar style to Miminae outside of their own restaurant. So addictive (and yes, unhealthy) is the fried batter that they purposely give you a mound of it on each plate to munch on and scoop into the soupy tteokbokki. The shrimp is king shrimp so they're big, plump guys with a lot of meat and fried in full, heads and all. But man, at 4K a shrimp, what a killing they must be making. The fried Jeju Pork was ordered more out of curiosity and it was quite unusual. The black pork is pounded thinly and then wrapped around perilla leaves and battered and fried. Then a bit of melted cheese is added atop. While intriguing in texture and flavor initially, I wasn't a fan of its heaviness and slightly porky smell. Thankfully the spicy tteokbokki helped offset it somewhat. If you don't mind paying a premium and (most likely) waiting in line, Myeongnang Snack is a fun spin on Korean snacking that's creative if unmemorable. A short and unexpected return to Jeju but a few more pleasant memories made. Till next time, Jeju!